#49 Second Cut, narrow pattern (rasp) half round and tapered. This is a high quality, woodworker, cabinetmaker's wood rasp. It has a narrow pattern and cut edges. Leaves a relatively smooth finish but is rougher than the #50. #50 Smooth, narrow pattern (rasp) half round and tapered. This is a high quality, woodworker, cabinetmaker's wood rasp. It has a narrow pattern and cut edges. Leaves a relatively smooth finish. Often used after #49. Both rasps are made by Nicholson. Designed for use with Size 1 Nicholson wooden handles. are the rasps USA made? Some are usa some are Portuguese. Can't tell the difference in quality. Both are very good. No, made in Brazil. Quality is not as good as before. I use them for other purposes, not woodworking so the quality is not as important to me. My Nicholson #49 is made in Brazil and my #50 is made in USA. Both are great tools for a bowyer. Nope they are made in brazil. As far as I know there are no hand punched rasps made in the us. Other options are auriou rasps and dragon rasps... I don't know where these are made. Unfortunately, Nicholson rasps are now made in Brazil and are not of the quality that the US made ones were. I now have all my new Nicholson rasps sharpened by Boggs Tool in California before use. Extra expense, but then then clu like they should. Will one of these Half Round Wood Rasps fit in a 3 / 4&quot; hole? I need to rasp out some Bench Dog holes that are just a tiny fraction under 3 / 4&quot; on my workbench. I cancelled my order for these rasps after being quoted as much for postage as the item cost. My letter to the Jamestown CEO seeking clarification was never replied to - apparently it is beneath the dignity of the CEO to communicate with customers! I have resolved to never deal with Jamestown Distributors again. There are many reputable firms out there who are customer focussed and who carry high quality tools. The Nicholson Rasps sold by Jamestown Distributors are inferior 'copies' of the original and made in South America - don't waste your money. I would not use this rasp for that application. This rasp tapers up from the end to over 3/4&quot; so will not go far enough into the hole to do what you want. The tip would fit, but it would be tapered at that point, and would, therefore, widen the hole at the upper end. A smaller file with a smoother cut would be better, or a dowel with sticky 80 grit paper. They fit but the round side is not the proper radius.You would be better with a modelers rasp.The Nicholson rasp would dig into the side of your dog holes. It starts off at 1/2 in. but quickly tapers to 7/8 in. So no, it would not work well. Perhaps a round &quot;rattail file would do the job. how wide is the 10&quot; cabinet maker rasp? I need one that will clean out a 1/2&quot; mortise. You would use a bench chisel to clean out the sides of a mortise and usually a shoulder plane for the tenon. The Nicholsen #49 and #50 are great files for shaping wood ( I.e. cabriole legs etc.) but not for fitting mortise and tenons. Michael,I would NOT recommend the 10&quot; cabinet maker rasp to clean out a 1/2&quot; mortise. This is because, although the rasp with starts out at 1/2&quot; it increases in width to 7/8&quot; within its first two inches of length. For this and other reasons I would recommend using a 1/2&quot; wide chisel to clean out your mortise. The very tip of the rasp (first row of teeth) is 1/2&quot; wide. The rasp tapers wider from there until it's about 7/8&quot; by the tang. It won't work to clean out a 1/2&quot; mortise. both rasps ,(nicholson #49 and #50) are about an inch wide. I found some smaller ones , which are around 1/2 inch wide but are only about 5 inches long. The #49 and #50 are the same size and are about 1 1/4 wide and taper down as shown to about 3/4 wide. Try looking at the Grobet detail file at Tools for Working Wood. Nice tool! 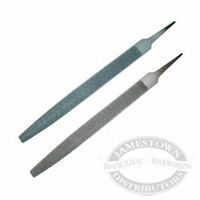 is there a difference between wood files and metal files, and if there is how do i tell them apart? The Nicholson # 49 and # 50 are excellent machine made rasps. These rasps should never be used on metal. They have numerous small cutting teeth unlike metal files. The teeth on the Nicholson # 50 are just a tiny bit smaller than on the Nicholson # 49, hence the scratch marks left by the Nicholson # 49 will be slightly coarser, but the difference is barely notiecable. (it`s like comparing 60 grit sand paper to 80 grit). I use the #49 most often. These rasps are excellent shaping tools (like shaping a cabriole leg). You can get finer rasps like the Auriou rasps;because they are hand made, expect to pay a much higher price; a Nicholson #49 has the same teeth size as an Auriou 8. Auriou also makes very fine rasps from size 12 up to size 15( extremely small teeth); the #15 cuts slowly but leaves a very smooth finish. The Nicholson # 49 is a very useful tool. Wood files are built to remove larger pieces of wood than metal files. Wood files (often called rasps) have lot of small scoops that look like finger nails. Metal files have straight lines, usually at an an angle, on the file so that as you push the file or pull it, the cutting edges are at an angle to the workpiece which makes it cut better. Does the Nicholson # 49, 50 rasps come with handles? They do not come with handles. The handles are sold separately. what is the length of these rasps? They have about 10 inches of working length. The ones I have are US made the newer ones are Brazilian or Chinese - can't say if the quality is the same. Overall length is around 12 inches, filing surface around 10 inches. It's 7/8 inches wide. Made in Brazil by Nicholson. Are these rasps USA made or foreign made? The rasps I bought are made in Brazil. Primarily, I use them for shaping mahogany and cedro guitar necks. They excel at this task. I learned this method at a shop that had older American made rasps. So far, I can not tell the difference. As far as I know they are made in the USA. They are good rasps, I know people that have had them for 10 are more years and still using them.I have the 49 and 50 and they have worked well for me. Made in Brasil. Contacted Nicholson about the difference in the foreign rasps - they claimed no change in production methods or materials. I'd been using them for about 8 years previous to the change, they were great to use. I now use French rasps... the &quot;new&quot; Nicholson are ok - I let my students use them, but I've found better. You might try googling for &quot;carving file&quot; or search for &quot;Auriou rasps&quot;. Could be that a set of rifflers is just what you need. yes, you might try looking at Woodcraft or Rockler if Jamestown does not have them. I used USA made Nicholson rasps and feel they were great tools.But new ones Brazilian made I have gotten are different.They have dull cutting edge.Unbelievably much different! Purchased to use in shaping a rifle stock. Came highly recommended to me by another woodworker. Good tool at the right price. Works great on shaping gun stocks. I have a #49 Nicholson rasp a few years old, made in Brazil. It works fine.I recently bought another for a spare thinking it might be sharper being new.Also made in Brazil. The teeth don't go out to the edge and the edge don't cut either. When I run my thumb against the grain the new one is almost smooth feeling compared to my old one.If you don't know how it should perform I don't know how to advise. I think some are good and some are bad. I built small boats and a good rasp plays an important part in numerous aspects of construction. This rasp is priced right top quality. Truly a "RASP" as a wood rasp should be! I'm in Gunsmithing school and use a few different starter rasp such as a 'Farrier Horse Hoof rasp'. When getting to the shorter and tighter areas requires the No. 49 for perfect use. I bought this rasp as a gift for my husband after he took a longbow making class. You had the best price online for the Nicholson #50 rasp that he wanted and he has already started making a second bow. Thanks so much for a great product! I've been just getting by with a generic rasp that was made in china. It was so slow that I'd switch to using sandpaper before going back to that cheap rasp.Finally bit the bullet and got the nicholson rasp after seeing videos of it being used and the apparent ease of wood removal.Gets rid of excess wood fast and is a fine enough cut that you won't spend as much time sanding gouges out of the wood.My favorite woodworking tool now! Bought 2 of these. One was great. The other looked like a factory second. The edges on that rasp were wavy and not cut correctly. I cannot use the edges of that rasp for anything. The flat and round faces were ok. Due to restocking fee and return postage I just decided to keep it. Price was cheaper than anywhere else by a good margin.Overall if you get a good one it is an excellent rasp. I purchased #49 and #50 to use on my next flintlock project. The files remove wood very quickly and are easy to control.